The research focus of the CAMM is on inventing, understanding, and improving the mobility of mechanical and aeronautical machines that are dynamic and often actively controlled during operation. This often takes the form of improving existing mobile platforms such as unmanned aircraft, unmanned ground robots, smart projectiles, air drop systems, autonomous miniature air vehicles, and rotorcraft. It also involves creating new hybrid machines with air mobility and ground ambulation capability such as the hopping rotochute miniature vehicle. Typically, research is performed at the intersection of dynamic modeling, control system engineering and design, and involves a mix of theory, simulation, and experimentation. Below are descriptions of several representative recent research projects. 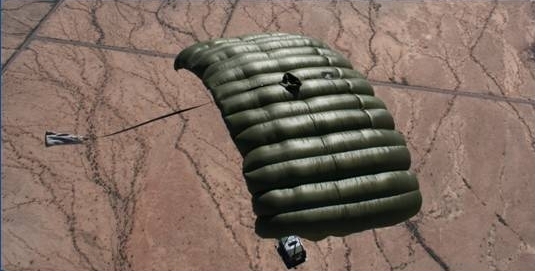 Parafoil and payload systems are unique flight vehicles well suited to perform autonomous airdrop missions. These air vehicles are compact before parafoil deployment, lightweight, fly at low speed, and impact the ground with low velocity. The predominant control mechanism for parafoils is left and right brake deflection. When a right brake control input is executed, the right back corner of the parafoil canopy is pulled down by changing the length of the appropriate suspension lines. Canopy changes created by brake deflection subsequently cause predictable changes in aerodynamic loads which is leveraged for control of the vehicle. 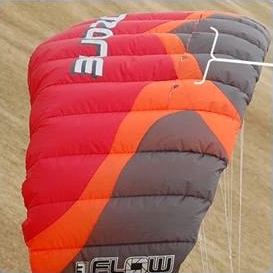 For most parafoils, deployment of the right brake causes a significant drag rise and a small lift increase on the right side of the parafoil canopy combined with slight right tilt of the canopy. The overall effect causes the parafoil to skid turn to the right when a right parafoil brake is activated. Although a key element of achieving precise trajectory control, longitudinal control is a more difficult undertaking. Symmetric brake deflection creates a reduction in airspeed but little change in glide slope. Human sky divers use weight shift for both longitudinal and lateral control. 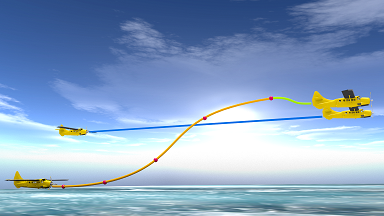 By shifting weight fore and aft, glide slope can be actively controlled and permits accurate trajectory tracking, to include very accurate ground impact point control in the presence of relatively high atmospheric winds. 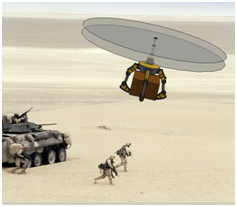 New and efficient longitudinal control mechanisms for fully autonomous parafoil and payload air vehicle configurations are needed to enable leap ahead ground impact accuracy improvements. In order to improve the accuracy of autonomous parafoil and payload aircraft several new flight control mechanisms have been created. One new control mechanism is called dynamic incidence angle control, and is physically realized by changing the longitudinal rigging of the parafoil and payload combination dynamically in flight leading to direct glide slope control. The extra degree of freedom of control requires simple rigging changes and the addition of one additional servo actuator to the system. When combined with traditional right and left brake control, dynamic incidence angle control enable both lateral (left and right turning) and longitudinal (glide slope changes) control. Another new control mechanism is called bleed air control, and it is physically realized by dynamically opening vent holes in the upper surface of the canopy to create a virtual aerodynamic spoiler. Symmetric activation of canopy spoilers yields longitudinal control while asymmetric activation creates lateral control. The combination of lateral and longitudinal control is an attractive feature for autonomous parafoil and payload aircraft since it allows the flight control laws to directly correct descent rate thus eliminating the need for descent rate estimation and the resulting error induced into the final delivery error. 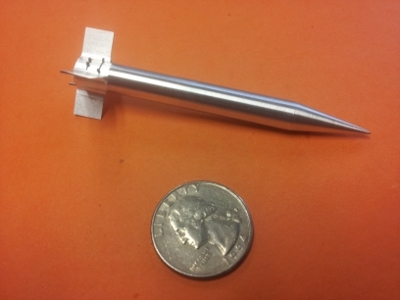 This research has included comprehensive simulation modeling combined with a flight test program on an exemplar micro parafoil and payload system. Flight test experimentation with the micro parafoil and payload system used a data logger equipped with a sensor suite that contains GPS, accelerometers, gyroscopes, barometric altimeter, magnetometers, and servo position so that the complete state of the payload along with all control inputs were recorded. Results indicate that a dramatic improvement in impact point statistics is realized with the addition of these new control mechanisms. Landing safely on uneven ground in unprepared areas and landing safely on a pitching and rolling ship represent two of the greatest challenges faced by rotorcraft conducting military operations today. It is often impossible for pilots to know the slope dynamics of the terrain below them when landing in these environments at night, or in Degraded Visual Environments (DVEs). Conducting these types of landings in a DVE is a difficult task for even the most skilled rotary wing aviators and has given rise to a significant number of rotorcraft accidents in Afghanistan and Iraq. Most current rotorcraft are limited to land on slopes of less than 10 deg, severely limiting landing site options. Moreover, landings in complex terrain are performed very slowly and unduly expose units. Ship-based helicopters routinely operate from a rolling, pitching and heaving flight deck in a DVE and in close proximity to the ship’s superstructure. Navy and Marine missions are conducted on a continuous basis to support operations and occur during day and at night, in all types of weather conditions. Due to endurance limits of aircraft combined with ship standoff requirements, landings typically have an associated time critical element, forcing ship landings in non ideal conditions. With the goal of aiding rotorcraft landing in unprepared, unknown, sloped landing areas that are potentially in motion, we are exploring fundamental issues associated with actively controlling the aircraft and landing surface interface. Rather than employing active control of the entire vehicle to affect this end goal, we are investigating the use of robotic landing gear using both dynamic simulation and experimental laboratory testing. The use of robotic landing gear could enable revolutionary new operational capability for future rotorcraft by greatly expanding available landing areas and greatly increase the speed of landing. In order to explore the capability of morphing robotic landing gear, a generic set of concepts have been defined including four legged single stroke configurations as well as four legged articulated multi component configurations. Analysis and simulation consider gear kinematics, system weight, power, and sensor suite requirements. A wide variety of scenarios are being considered including fixed landing sites with various terrain roughness, as well as moving landing sites with various motions indicative of ships in moderate to high sea state and ground vehicles traversing a bumpy road. The ability of robotic landing gear to control and eliminate ground resonance instabilities is under exploration. Against these scenarios, a diversity of parametric trade studies are being conducted including aircraft landing velocity and attitude, morphing robotic landing gear type, geometry, sensors, control strategy (passive or active), and control law. 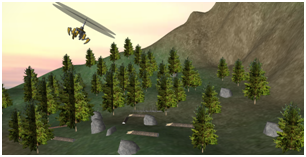 Parametric trade studies are being executed using a comprehensive The simulation model that includes air vehicle flight dynamic degrees of freedom, morphing landing gear degrees of freedom, and dynamic states associated with terrain mechanics. Since a number of different robotic landing gear topologies are being explored, a general multibody dynamic modeling approach is being employed for dynamic simulation. Control mechanisms for smart projectiles must be capable of altering the trajectory of the projectile in such a way that impact point errors induced at launch and in flight can be corrected. At the same time, the physical control mechanism must be rugged to withstand high acceleration loads at launch, small so that payload space is not compromised, and inexpensive for cost considerations. Many different control mechanisms have been developed with these requirements in mind, but all concepts essentially fall into three categories: aerodynamic load mechanisms, jet thrust mechanisms, and inertial load mechanisms. 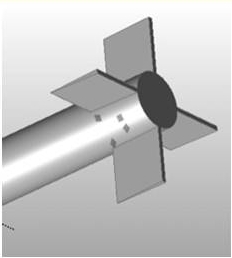 A new smart projectile control mechanism that uses a grid of micro spoilers has been created. The small micro spoilers are used to induce an aerodynamic force and moment perturbation on high-speed projectiles due to shock wave interaction between the fins, body, and micro spoilers. The micro spoilers are activated in flight in a coordinated fashion to generate maximal control authority. A set of parametric trade studies has been conducted on different micro spoiler configurations uncovering its effects on control authority and accuracy. Prediction of the effects of micro spoiler activation on aerodynamic loads has been produced using computational fluid dynamics analysis while flight dynamic simulation has been based on a rigid body representation. Results to date indicate that very substantial control authority can be generated using this type of projectile control mechanism, particularly at high speeds. With a properly configured flight control law, impact accuracy down to the level sensor errors is possible. The demand for small unmanned aircraft is increasing, as applications for their use proliferate in both the civilian and military sectors. These vehicles serve in diverse roles ranging from military reconnaissance to journalism, environmental science studies, and rescue mission support in the civilian realm. This large variation in missions requires small unmanned aircraft to safely operate in a wide range of environments and conditions, from high altitudes to urban environments. Regulations aside, small unmanned aircraft are currently very restricted on where and when they can fly due to wind gust and turbulence sensitivity. Power and payload weight limitations pose other challenges that also reduce mission effectiveness. The use of bleed air for full flight control of small unmanned aircraft allows for low-power, lightweight actuators to replace the servos and controls rods that conventional controls (ailerons, rudders, elevators) rely on. A bleed air control system consists of arrays of ports installed on the upper and lower surface of all lifting bodies (wings and tails). These ports are actively controlled and when open, allow air flow from the lower surface (high pressure) through a plenum in the wing and out of the upper surface (low pressure). This air flow is passively driven by the pressure differences surrounding the wing. The air flow spoils the lift, and this change in lift force is used to maneuver the vehicle. 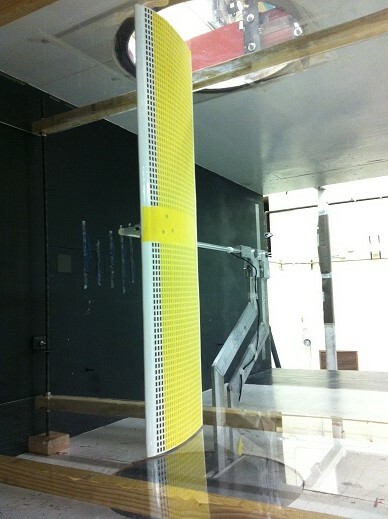 Wind tunnel tests have been carried out to determine the changes in lift and drag associated with various port opening configurations. These experiments feed the aerodynamic data in flight simulations utilized for conducting trade studies. Additionally, advances in manufacturing, such as multi-material 3D printing, have enabled compliant joints to be embedded in rigid structures, introducing flexibility into wing structures. The use of an inherently flexible wing structure in conjunction with bleed air to amplify the control authority of the vehicle is being investigated through multi-body flight simulations. Greater control authority would aid the aircraft in overcoming wind gusts and increase maneuverability in complex environments. Modular robots, which consist of identical building blocks connected in a variety of different configurations, have the ability to accomplish new missions, adapt to a changing environment or recover from damage or failures. 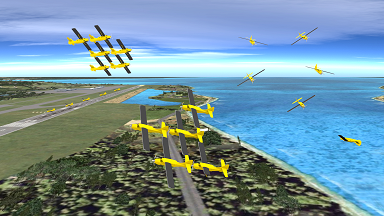 A modular aerial robot, or meta aircraft is a large aircraft composed of individual smaller aircraft where the connection joint is envisioned to be able to transfer power, information and/or aircraft loads, while each individual aircraft is capable of flying independently. These aircraft are designed to attach and detach in flight using a wing tip to wing tip, tip to tail or a lattice structure configuration. By allowing highly specialized vehicles to connect in flight, a meta aircraft could conceivably fly to a target area, break apart, perform multiple missions, and reconnect to fly home. If a search and rescue mission is conducted, search vehicles fixed with radar equipment scanning a certain region could connect with other aircraft fixed with weaponry to defend against any hostile entity while further connecting with more aircraft that are designed to carry most of the fuel/power supply. In addition to an increase in adaptability, connected aircraft have the benefit of reducing the effect of wing tip vortices thus increasing L/D which directly impacts range and endurance. Meta aircraft also increases the effective mass of the aircraft to reduce the sensitivity of atmospheric disturbances. The dynamics of meta aircraft systems are explored with a focus on the changes in fundamental aircraft modes and flexible modes of the system. Specifically, when aircraft are connected, the fundamental modes change, can become overdamped or even unstable. In addition, connected aircraft exhibit complex flexible modes and mode shapes that change based on the parameters of the connection joint and the number of connected aircraft. Additionally, the connection dynamics are explored for meta aircraft where the vehicles are connected wing tip to wing tip using passive magnets with a particular focus on modeling the connection event between aircraft in a practical environment. It is found that a multi-stage connection control law with position and velocity feedback from GPS and connection point image feedback from a camera yields adequate connection performance in the presence of realistic sensor errors and atmospheric winds. Furthermore, atmospheric winds with low frequency gusts at the intensity normally found in a realistic environment pose the most significant threat to the success of connection. The frequency content of the atmospheric disturbance is an important variable to determine success of connection.